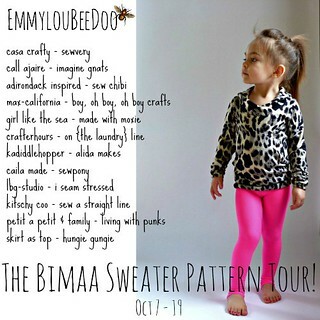 rare saturday post for you today, because i, along with my pal Erin over at hungie gungie, am the last stop on what has been a pretty epic tour for the Bimaa Sweater Pattern by LouBeeClothing! i chose to go pretty basic with my Bimaa – i noticed recently that almost every top, dress, legging, and shoe that Em owns has some sort of print on it, and while print mixing is “in” these days, i believe that only applies to two prints, not three or four, which she has often been known to combine. this kid needs more solids to go with all the print stuff. when i went shopping (at fabric depot), i looked for the perfect solid, and found this magenta knit. it’s a blend of some sort, and i was so excited about the ideal weight to drape ratio that i didn’t check the bolt to give you any details about it (BAD BLOGGER). it sort of turned purplish if my iron was too hot, though, so it’s got more stuff mixed in there than your typical interlock, i’m guessing. i love how Sarah’s patterns are basics with a twist – they’ve all got unexpected design elements that make them really stand out. plus, they’re just so darn COOL! 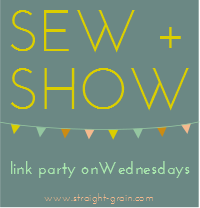 i can’t wait to sew up some Hosh Pants (and see if I can persuade Em into wearing non-leggings-pants). i chose to sew the cowl neck version of the Bimaa (there are also hood and a shawl collar options included in the pattern). i love a good cowl sweater though, and a mini cowl was just irresistible. the pattern goes from size 12 mo to size 6, there’s no hemming (i sewed the whole thing with my serger, and did the sleeve cuffs with the same method as the waistband), it’s a super fast and painless to sew, and turns out a very stylish little sweater, don’t you think? this Bimaa is a size 4T, which is actually larger than i usually sew for her and didn’t match Em’s measurement on the chart, chest-wise, but i saw Jess’ version and knew our little gals were the same size, so i went with it. i will say though, i think this pattern is sized to fit pretty snugly. 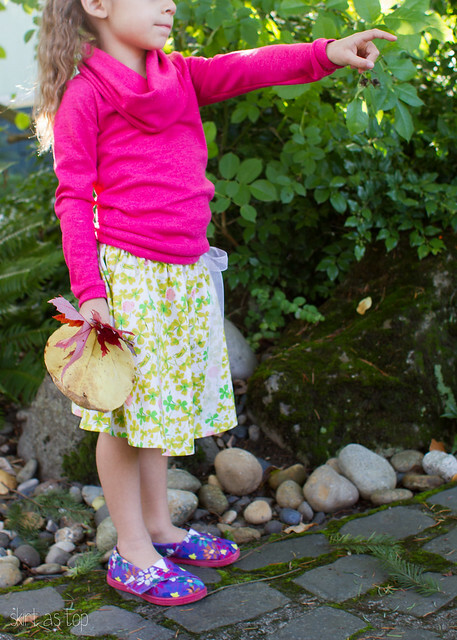 Em is at the bottom of the weight charts for her age and the 4T fits her great, but if your little one is normal/larger, might wanna size up from what you usually sew, at least in width. for a normal-height skinny kid like mine, though, the slimmer sizing is refreshing – i usually sew 3T bodices for her but i actually prefer to sew closer to her commercial size, ya know? 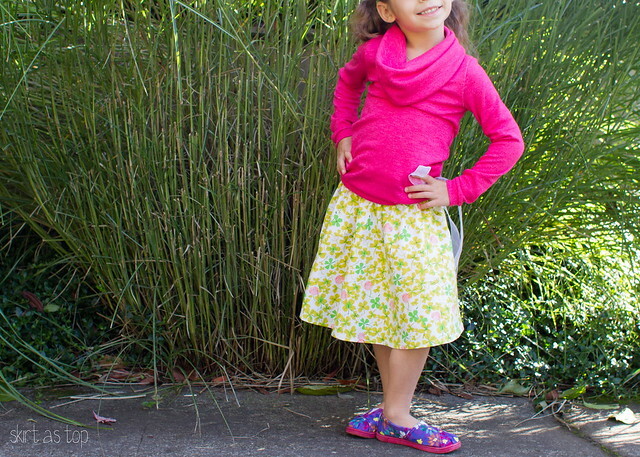 she’s 5 and a half and wears a 5 in store-bought clothes. 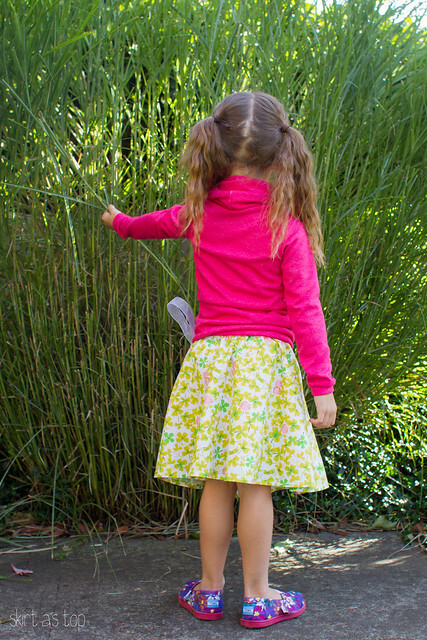 to go with the Bimaa, because she really loves choosing her own skirt/top combos these days and she’s been getting so much taller, i made her a swingset skirt by Oliver + S. i was so hooked on the pattern after making Sadie’s, and i thought the fuller silhouette would be the perfect way to show off the Bimaa. this swingset is also a 4T, and i think i added a bit of length for extra growing room. the skirt fabric is Heather Ross’ Pink Cricket Clover from Briar Rose for Windham, which I got again at Fabric Depot (but you can find online here). 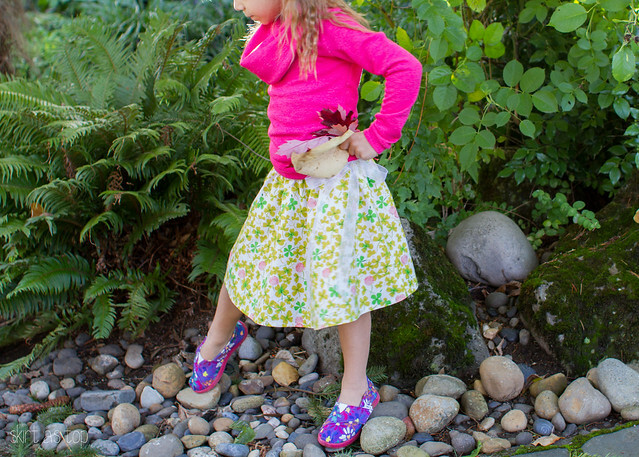 i always love the base fabrics Heather chooses for her lines – the “quilting cotton” Briar Rose is light and soft and awesome for kid’s apparel…never mind her perfect designs. so sweet and playful. 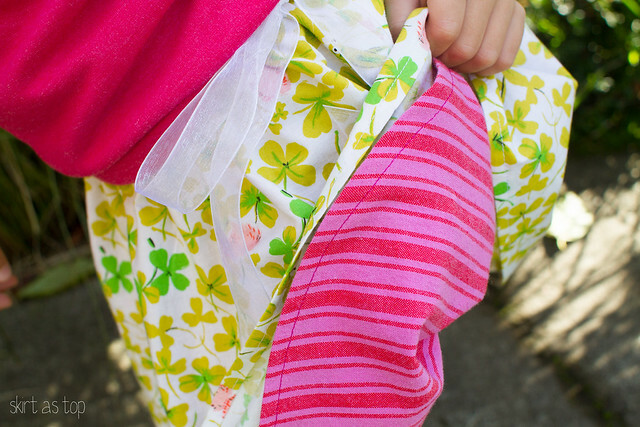 it’s got an organza-type ribbon and is lined with a loosely woven cotton stripe in magenta/red as a fun surprise. 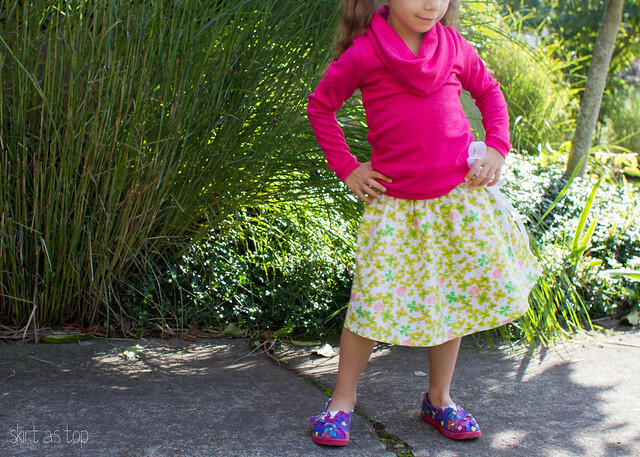 great little layering pieces for fall, winter, and maybe even spring if her growth spurt slows down! you can get the Bimaa pattern right here and the swingset pattern right here. both are PDF only. oh and don’t forget to head over to check out my buddy Erin’s Bimaa today too (TEASER: it’s got EARS!) 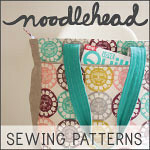 and enter to win a copy of the pattern in her giveaway! thanks so much for having me on this fun fun tour, Sarah! i was given the Bimaa Sweater Pattern for free as a participant in the blog tour, opinions are 100% mine. I think it’s time for me to learn how to sew! This Bimma sweater will be my first creation ever. (Besides that pillow I made stuffed with my hair when I was ten.) LOVE IT!!! 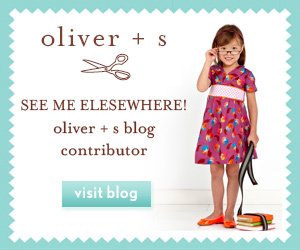 This is super cute – like a little girl Renfrew! I love how big the cowl is. The next time I make the renfrew, I may have to make the cowl a little bigger to try to capture this look! This is so cute and colorful! I love it!! so cute tour buddy! Ellery is quite the print-mixer too… i really need to give her some more solids to work with!! 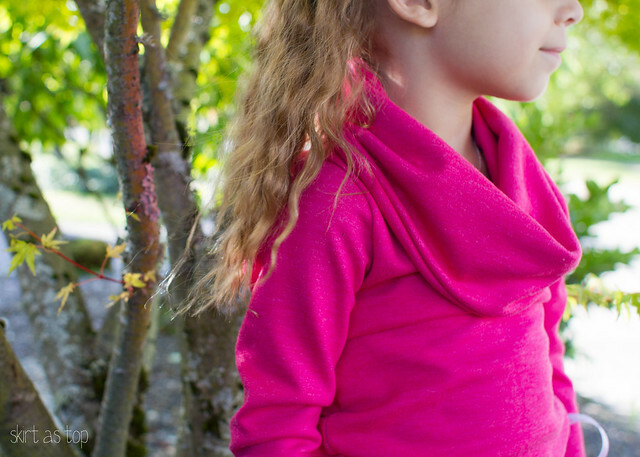 And how cute is this cowl style for little gals???!!! Considering the heinous sizes I usually sew for my kids, it was pretty different to be making violet something in almost her age size. I think hers is in a 2t. Yay for putting more solids into the wardrobe! They feel pretty unexciting when you’re using them but it’s nice to see something worn a lot because it looks nice with more things. I amuse myself by adding graphics to the solids. Love the skirt too! Isn’t that fabric so sweet? 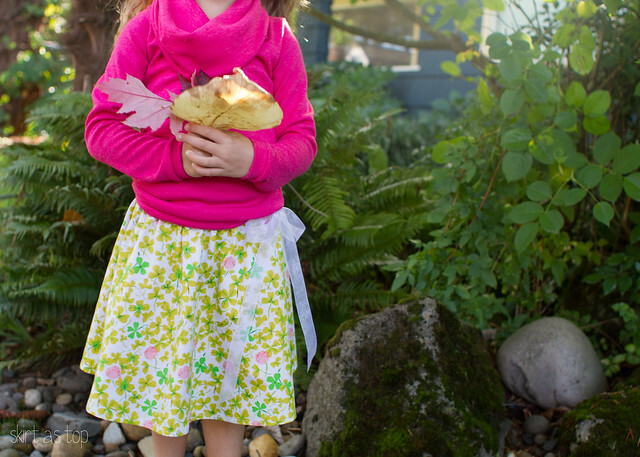 I’m sad that violet won’t wear skirts because her briar rose frog skirt is languishing in her dresser and it’s so sweet! I’m kind of disappointed that I can’t pass some of her things along to your baby. She won’t wear her Sally birthday dress in the wicked teepee fabric either. 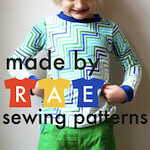 I’m sewing one just like this for Avery tonight, but in a coraly-red. I showed her this post so that she wouldn’t be disappointed that its not a dress. Cheers to our girly-girls! this is so pretty and sophisticated yet comfortable looking. i might have to make this one for indigo. beautifully done! great outfit. That will be one very useful, very pretty sweater. so cute! It’s good to make those basic solid staples sometimes, huh? 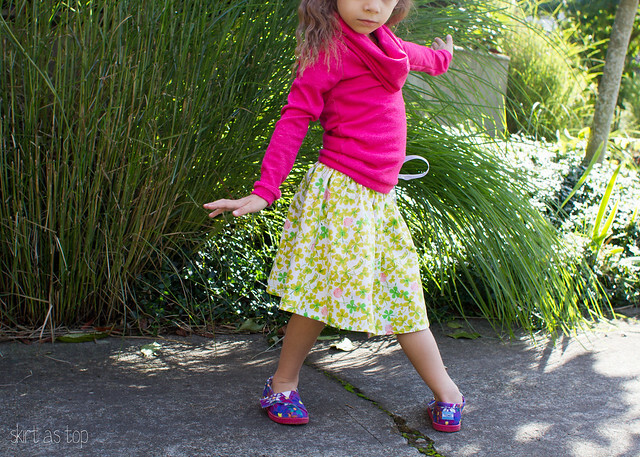 Even if they feel boring to sew, they’re usually the cutest and most worn, at least for us! i’m loving all these Bimaas that keep popping up! yours looks so cozy. and the skirt is adorable!! I love love this top! 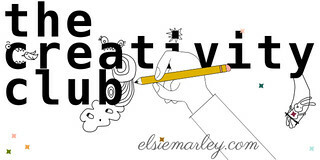 I have been eyeing it around blogland and just might get it because it is too cute to pass up! I really like that you kept it solid. I love this pattern, it is soo cute!